paGO Commerce is a free Joomla extension for e-commerce, launched by ‘corePHP’ to replace an aging and antiquated Joomla extension known as VirtueMart. It took ‘corePHP’ over four years to develop paGO Commerce, a free Joomla extension that launched just a few short months ago. 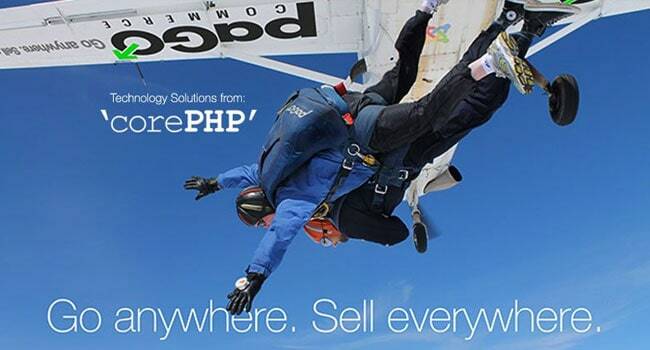 The ‘corePHP’ team members got the idea for paGO Commerce from Joomla users and customers while exhibiting at the CMS Expo, almost five years ago, where I was co-host of the event, in Chicago. While the Joomla CMS was (and is) on the upswing, frustration among Joomla developers was high, as there was a vacuum for a truly “professional grade” Joomla extension for e-commerce, so it became rather challenging for the Joomla fans (including me!) to boast of all Joomla’s capabilities, without a solid e-commerce solution in place at the time. Meanwhile, as if to rub a little salt in our Joomla wound, Drupal guru Ryan Szrama and his then upstart Commerce Guys were making a killing at the next booth over, having created and just launched a new e-commerce cart called Drupal Commerce to show off at CMS Expo. Drupal Commerce was an Ubercart fork and “distro,” also co-founded by Szrama (while he was working at a pizza joint), a fascinating story I’ll share in a future blogpost. So, at the urging (baiting, really) of numerous Joomla Developers who were at that year’s expo, ‘corePHP’ stepped up to the plate, as it was clear Joomla needed an enterprise-ready e-commerce solution to compete head-to-head with Drupal Commerce, Magento, and a few other fast-growing open source e-commerce upstarts, and help take Joomla out of the VirtueMart stigma. While VirtueMart was an OK hobbyist’s e-commerce solution (and still is), to learn how a cart works, the lack of support, shaky security, and inconsistent codebase made for a less than desirable solution for professional integrators and Joomla website builders in the Joomla Community. There had to be someone foolish enough ambitious enough to take on the monumental task of creating a new PCI compliant, 508 compliant, accessible, easy to use, professional grade, free Joomla extension for e-commerce, right? Rather than complain, and sensing an opportunity to do something that was much-needed in the Joomla community, ‘corePHP’s Steven Pignataro and his partner Jonathan Shroyer threw caution to the wind, and started mapping out what would ultimately become paGO Commerce. The idea for new, free Joomla extension for e-commerce was conceived. Four years back, when development began on this new Joomla extension, there was no such thing as “responsive design.” That, and many other fast-moving technology evolutions caused the core boys to hit the “pause button” on this project, while they figured out how to “futureproof” further coding, making it more modular, lighter weight, and easier to update. About two years into building the codebase, Steven and Michael had to do what many projects do on the first try—they scrapped the whole project, and began again, with a new focus on flexible, “futureproof” code, mobility, and global capabilities such as currency conversion, multi-language capabilities and more. We decided to make paGO Commerce free and open source, and that’s how it will stay. Some Joomla extension developers don’t think Free and Open Source matters any more. Perhaps they’re just not thinking. While we may take “free and open source” (FOSS) for granted, that’s only natural. After a second re-start, among hundreds of changes came its branding. After a brief flirtation with calling it “kaGO” (don’t ask), ultimately, the partners decided upon the brand name of “paGO Commerce.” The word “pago” translates into several languages as the word, “payment,” or “pay.” You’re free to pronounce it as you wish, “pay-go” or “pah-go,” it works great either way. It’s short and sweet, and it’s one of those words that grows on you over time. We tried to boil down what makes paGO different, better and focused on our purpose, which is to make a full-blown e-commerce suite that can not only do what conventional e-commerce carts do — sell to people on desktops and stationary devices—but also, sell to people who are on-the-go. In many cases, over 50% of traffic to e-commerce sites comes from people using mobile devices, and those devices come from all around the globe, not just in your familiar old neck of the woods. Tablets and smartphones are now the norm, and you need e-commerce software that’s focused on including them, not excluding them as prospective buyers. Simultaneously, we’re working on making not just the customer-facing interface mobile and global, but we’re working to improve the admin-facing interface as well. Not only are customers mobile, but so are you! You need to know you’re working with a core team that’s focused on producing solutions that empower you to go anywhere, and still manage your business. Beyond a catchy slogan, that’s paGO Commerce’s commitment to the future. We’re very encouraged by the launch of paGO Commerce thus far. We’re also thankful for the feedback we’ve received by the development community thus far, on ways they’d like to see paGO improved. We’ve already made several changes, but before getting too far ahead of ourselves, we’d like to get more specific feedback on paGO Commerce from those who are currently using paGO Commerce, or have given it a trial for their own use. This month, we’re making it our mission to get insights and ideas on what features, capabilities, processes and integrations to work on next, to make paGO Commerce even better for today, tomorrow and the next year. Your comments on this blogpost are welcome (just login first). We’ll be reaching out to learn from current users of paGO Commerce what they think, as well as from those who have tried paGO Commerce for their business. If you’ve tried it out but it didn’t work for you, what was that roadblock? If you’re using paGO and love it, what do you love about it? How does paGO help your business stand out from the rest? Where could we improve paGO Commerce to make it an even more useful Joomla extension for you? Give it a shot, then give us a shout! So, if you haven’t yet downloaded and tried out paGO Commerce, I encourage you to give paGO Commerce a try. We have a fully operational paGO demo site set up, and downloading and using paGO Commerce is free. There are no hidden fees, sales tricks, hosting charges, or privacy bots, ingesting your information for resale. We won’t spam you into oblivion either (I hate that worse than anyone). Just download paGO, install it using Joomla, and bam, you can start building your own e-commerce empire in no time. Will it do everything you want? Heck no. No software will right away, but in time, we can help you get where you want to go! We’re interested in your feedback, so download this free Joomla extension and give it your own trial run. We’ll be in contact with all who gave paGO Commerce a try, in order to get feedback on what to do next with paGO Commerce, ‘corePHP’s newest free Joomla extension that brings e-commerce to the rest of us, helping you go anywhere, and sell everywhere. This entry was posted in E-Commerce and tagged e-commerce, Joomla Extension, paGO Commerce on March 17, 2015 by John Coonen.